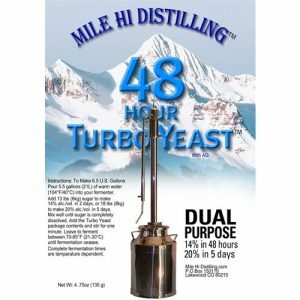 Mile Hi Distilling 48 Hour Turbo Yeast is on sale at $2.99 / packet. Take advantage now, this the sale will end soon. This Mile Hi Distilling 48 Hour Turbo Yeast is a nutrient and yeast that is a higher alcohol tolerant yeast and will produce 20% ABV in your sugar wash. It is simple to use by just adding water and sugar then let ferment for 5 days. Keep a few inches of head space so the lid doesn’t blow off. Use an air lock to let CO2 out and keep the fermentation clean.